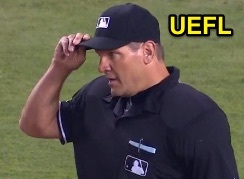 After after taking a foul ball to the mask in LA, Chad Fairchild did not umpire the ensuing Rangers-Dodgers series finale and was replaced at third base by call-up umpire Chris Segal. During the bottom of the 8th inning of Wednesday night's Rangers victory, Dodgers batter Enrique (Kiké) Hernandez fouled a 97 mph fastball from Rangers pitcher Tanner Scheppers directly into the lower jaw portion of Fairchild's traditional-style Wilson facemask. After evaluation from Dodgers training staff, Fairchild remained in the contest for the ensuing inning-and-a-half of play. Fairchild's replacement on Thursday Chris Segal joined umpires Marvin Hudson (HP), crew chief Jim Joyce (1B) and Greg Gibson (2B) for the finale, a 1-0 balk-off.